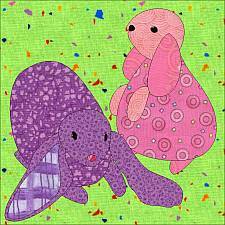 Lucy and Ethel, the adorable Sundrop Lop-eared Bunnies, are sized for 6" or larger applique blocks. Pattern includes placement guide and general applique instructions. Detailed instructions for a specific applique method are not included.